Multi-instrumental minstrels playing renaissance guitar, bowed psaltery, English bagpipes, hurdy gurdy, lute, ud, cittern, percussion and many others. From the delicate sounds of renaissance guitar and bowed psaltery to the vibrancy of English bagpipes and hurdy gurdy, Sautrie present the very best of historical music. Sautrie is a multi-instrumental duo performing historical and traditional 17th Century, Medieval and Tudor music in authentic period costume. Dave Chattlerley plays hurdy gurdy, renaissance guitar, lute, ud, cittern, pipe and tabor, and percussion. He also sings. Trevor James plays English bagpipes, psaltery, smallpipes, whistles, cittern, renaissance recorder, ud, pipe and tabor, and percussion. Embracing such tunes as country ayres, courtly ballets and rustic brawls, Sautrie bring the art of minstrelsy alive. 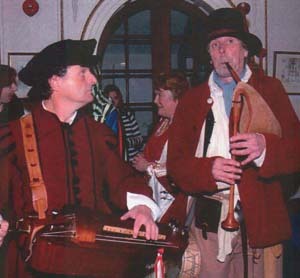 Sautrie have performed and entertained throughout the country at various castles and historic sites as well as corporate events and private functions.